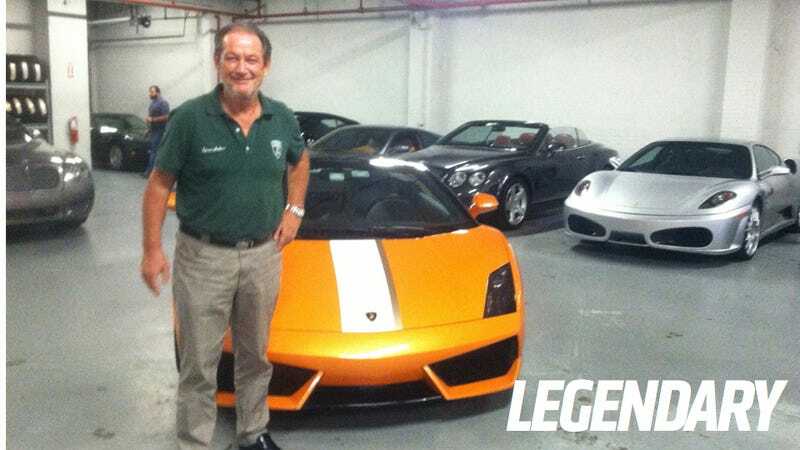 I got a note the other day that Valentino Balboni would be in town this week for an annual Lamborghini rally with Gotham Dream Cars. The note also asked if I'd like to meet Valentino. Short answer? Yes. Long answer? Hell yes. Last night I sat down with Signore Balboni, but I didn't want to discuss what we've all heard before. We know he came from humble beginnings and worked his way up to one of the most enviable jobs in the entire world. He is now retired, but travels the world as a brand ambassador to various Lamborghini events. I tried hard to get him off the script and company line, but he's as good at being politically correct as he is a test driver. Sure I read Jalopnik. I really like it, you post a lot of great videos and things. I was concerned at the beginning when we started with the idea of rear-wheel drive, because after so many years of all-wheel drive, people were so used to all-wheel drive, it was smooth and nice and comfortable and safe, I was afraid people would not like it. But I was wrong, surprisingly everybody was waiting for two-wheel drive. The best for me would be two-wheel drive...I think it's good to have both, but personally I prefer the two-wheel drive because this is the way I started. Porsche is an historical car. Porsche for me doesn't do anything wrong. They keep on with their personality and character, today as it was 40 or 50 years ago. Porsche is an icon for me. It is the father of the sport car. It is good that Ferrari still exists. They are referential for everybody. Pagani I have a lot of respect for. I know the guy, I know how fanatic he is, he goes through details. It's good to have somebody keeping on with this old philosophy of a small company doing good things. He's a lot like early Lamborghini. Well so many things happen, so many opportunities, so many comments. [I then pressed harder and asked if anyone had offered anything salacious or illicit to get a ride] Not in this way, but I like how people appreciate what we do.